FIDE recognizes for its own tournaments and matches only one system of notation, the Algebraic System (see FIDE Handbook, Appx C. Algebraic notation). 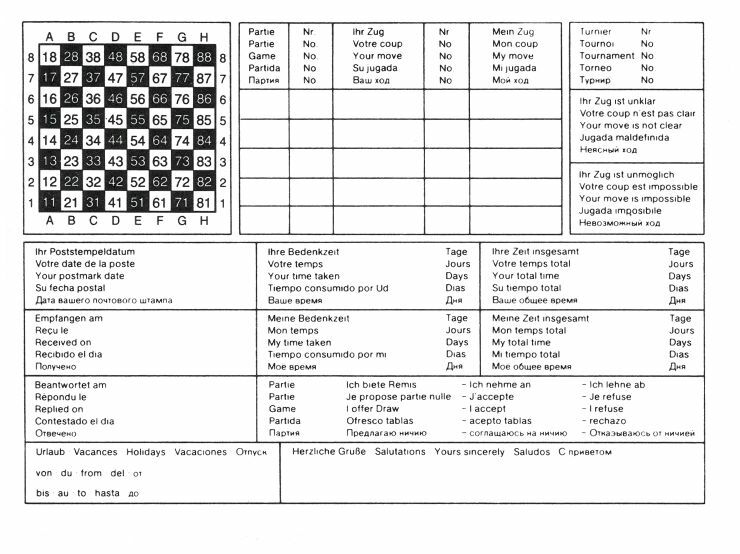 However, in international correspondence chess played by postal transmission the use of algebraic notation may cause confusion, since different languages have different names (and therefore different initials) for the pieces. That is why ICCF numeric notation (called sometimes international notation) is the official chess game notation for all ICCF games in postal (or email until 2008) events. In numeric notation each of the sixty-four squares of the chessboard is invariably indicated by a unique combination of a two digits (see cc postcard above). The first digit describes the file (from the left to right for White and from right to left for Black) and the second one the rank (from bottom to top for White and from top to bottom for Black). Each move of a piece is indicated by giving four digits – the first two are the code for the starting square of the piece that is moving and the last two are the code for its destination square. For example, the move that would be written 1. e4 in algebraic notation would be written 1. 5254 in numeric notation. The pawn starts from square (5,2) (file 5, rank 2) and moves to (5,4). All moves, except for pawn promotion, consist of only four digits. Neither the type of the moving piece nor captures are specifically marked in numeric notation. In pawn promotion a fifth digit must be added: “1” for queen, “2” for rook, “3” for bishop and “4” for knight. For instance in the case of a pawn on f7 moving to f8 and promoting to a rook would be 67682. A four digit notation where the ending rank is omitted (because it is always “8” for White and “1” for Black) can also be seen: 6762. However, this is confusing and against the standard. The system was implemented into ICCF in 1951 by Swedish player and ICCF official, Erik Larsson.